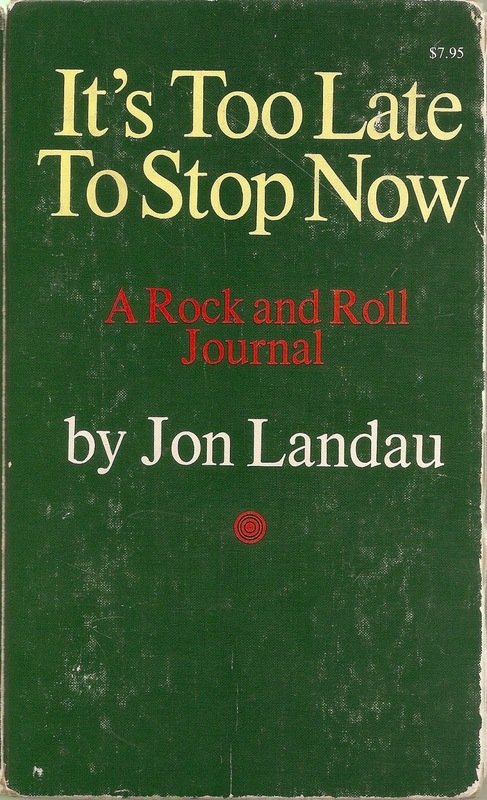 I've been dipping in and out of Jon Landau's It's Too Late To Stop Now: A Rock and Roll Journal, published in 1972, a gathering of the critic's late-60s and early-70s music writing from Crawdaddy!, Rolling Stone, and the Phoenix. I always enjoy reading "on the ground" reports about bands and artists that are now mythic or otherwise "classic," and Landau writes with real present-tense passion and smarts about the on-going travails of the Stones, Dylan, Joni Mitchell, Otis Redding, Credence Clearwater Revival, Wilson Pickett, Sky Stone, and many others who were turning him on, challenging him, and/or disappointing him. One of his pieces, "Rock as Art," really resonates. I've always said that I look for art in art, not in rock and roll, a pithy comment that hasn't always served me well among my music writing friends. On my dark days I question the limitations of this long-held creed, yet I always return to it. In college, rushing between studying, say, Franz Kline or Joan Mitchell in an art history class and James Joyce and Sylvia Plath in a literature course, still tingling with the head-lifting discoveries of each, I'd lose myself to the Ramones or REM or the Jam on my Walkman, and that experience, sonically and bodily intense, was far different but no less urgent than what I'd experience in the classroom. 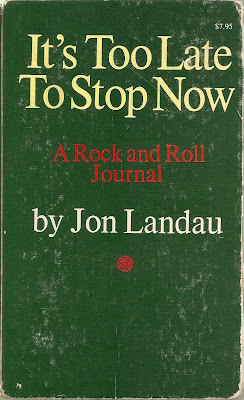 "Rock is not primarily poetry or art," Landau argued, "but something much more direct and immediate than either." This I felt. I didn't much want to find cross-currents between my American Literature syllabus and the playlist to my afternoon radio show at WMUC 88.1 FM. Neither cancelled out the other, of course, yet the distinction—between literature and eight notes, between the plastic arts and a transcendent middle-sixteen—felt like holy writ. That gap hasn't narrowed all that much since I was in my late teens and early twenties. Perhaps that should embarrass me. Landau, too, was preoccupied with the matter. Though some of his later industry behavior, particularly his monomaniacal, ruthless management of Bruce Springsteen, is suspect, his writing, especially his early writing, really impresses me in its authenticity, energy, and ideas. He was informed, and he had arguments to make. His essential premise in "Rock as Art," it must be said, is wobbly: he pushes far too hard to separate the supposed binaries, allowing for little gray area in between, though this was perhaps not as unsophisticated a point of view in 1968, when Landau wrote the piece, as it feels now. (Though his friend and colleague Greil Marcus was already poking holes in it.) He's prone to overstatements and unsupported generalizations, and yet his direct drive here lands on target. I confess, turning up the volume, that he's got my sympathetic ear. "Rock and roll has to be body music, before it can be head music," Landau writes, "or it will wind up being neither." That's scriptural, that. It must be realized that the core attitude of rock, with the early Beatles as much as with Little Richard, and the core attitude of formal art were antithetical. Rock was not intended to be reﬂective or profound. God help Little Richard if he had had to survive in the atmosphere of an opening night art gallery. Yet over a period of the last "two years, the artiness cult has grown within the rock community. More and more people expect of rock what they used to expect of philosophy, literature, ﬁlms, and visual art. Others expect of rock what they used to get out of drugs. And in my opinion, rock cannot withstand that kind of burden because it forces onto rock qualities which are the negation of what rock was all about in the ﬁrst place. But why rock and roll has turned to the more preachy, poetical and pretentious style which it sought to disparage in its earlier years, at this particular point in time, is a very complex question. I think it has a lot to do with the fact that as older people, including many refugees from the folk-scene of the early Sixties and many post-adolescents in general became involved with rock, they wanted it to say more than it already did. It wasn’t good enough to just sing about cars, balling, dances, school, and summertime blues. There was a feeling that you have got to say something big and new; The self-infatuation and easy half-truths that come so easily with semi-religious mentality ﬁlled that void and created the kind of piety and solemnity which is often rock’s worst enemy. The joyfulness and uninhibited straight-forwardness which is such an essential side to all rock and roll was often lost in the shuffle. Rock became cerebral. Of course, we can’t force rock back into its own past. But rock, in its earliest period, created a life style which has relevance today, and to which we may ﬁnd more and more of our leading rock stars turning as they reach a dead end with the kind of artistic, proselytizing mode that infested so much of the recent outpouring of pop. There is nothing wrong with being serious if you keep it all in perspective and if you have the artistic ability to be serious. Most rock and roll musicians are banal, amateurish and insipidly stupid when they try to express their philosophy of life in the context of popular music. The only thing I would insist on is that rock functions at its best when it does not seek to over-generalize, preach, or tell people what to do or think. It is at its best when it is used to explore the experience of the musician and the listener, when it seeks to entertain as well as provoke, when it realizes that rock is not primarily poetry or art, but something much more direct and immediate than either. Rock and roll has to be body music, before it can be head music, or it will wind up being neither. Rock and roll may be the new music but rock musicians are not the new prophets. Cue the 1970s and progressive rock. The next act dawns. 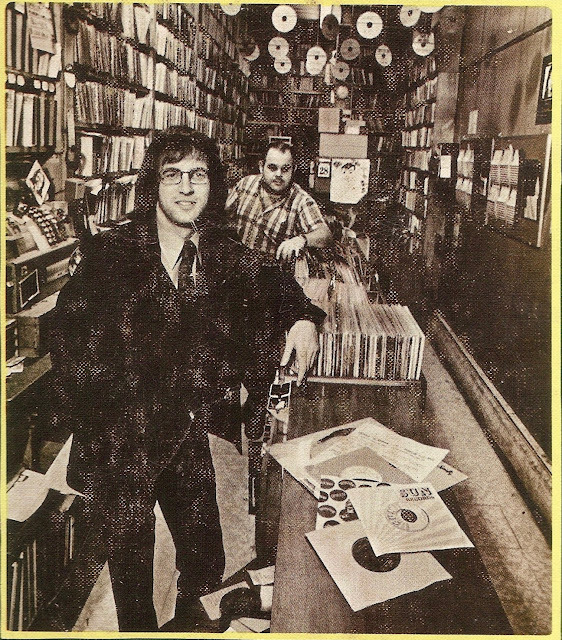 I loved that record store. Oldies heaven. The guy in the back, Big John moved his stock to Cheapos in Central Sq. Cambridge at some point. Thanks for writing, Michael! Didn't know what store that was.